The use of molecular biological techniques in genetics is having a massive impact on the investigation, diagnosis, treatment and control of genetic disorders. 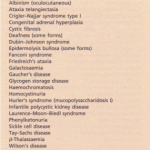 Some genetic disorders, for example phenylketonuria or haernophilia, can be managed by diet or replacement therapy, but most have no effective treatment. By understanding what causes genetic damage potential mutagens, such as radiation, environmental chemicals, viruses or drugs (such as thalidomide), can be avoided. Conventional therapy consists of controlling rather than curing the genetic defect. 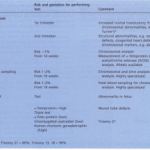 In some conditions gene product replacement may ameliorate the symptoms, e.g. the production of insulin (from recombinant DNA) for the treatment of diabetes and factor VIII replacement in haemophilia A. Current research suggests that for many defects ‘gene therapy’ may be an option in the future. 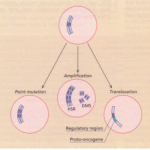 Gene therapy entails placing a normal copy of a gene into the cells of a patient who has a defective copy of the gene. For example it might be possible to remove bone marrow cells from a patient with f3-thalassaemia, culture the cells in vitro and infect them with a retrovirus carrying a human f3-globin gene; cells with normal f3-globin would then be selected and replaced into the patient’s bone marrow. 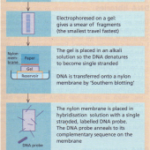 These sorts of experiments involve somatic tissue only, not the germline, so altered DNA would not be inherited from the offspring of a person who has undergone gene therapy. Current experiments are concentrated on the recessive disorders, such as cystic fibrosis where the disease is due to absence of a normal gene product. In these cases it is sufficient to introduce one functional normal allele of the relevant gene in order to overcome the genetic deficiency. However in dominant disorders the pathogenic potential of the mutant allele is normally expressed in the presence of a normal allele. This requires gene correction where the mutant sequence is replaced by an equivalent sequence from a normal allele or the mutant allele is inactivated. Such procedures are more difficult and, therefore, attempts have concentrated on recessive disorders focusing on gene insertion into somatic cells. The gene responsible for cystic fibrosis was first localized to chromosome 7 by linkage ‘analysis. The cystic fibrosis transmembrane regulator gene (CFTR) was then isolated by chromosome-mediated gene transfer, chromosome walking and jumping. The CFTR gene spans about 250 kb and contains 27 exons. The DNA sequence analysis predicts a polypeptide sequence of 1480 amino acids. The CFTR gene also encodes a simple chlo ride ion channel within the CFTR (Fig 2.9). In most patients there is a single mutation with a 3 bp deletion in exon 10 resulting in the removal of a codon specifying phenylalanine. There are also over 100 different minor mutations of the CFTR gene with most mapping to the ATP-binding domains. This has led to the improved diagnosis of cystic fibrosis as well as new strategies for conventional drug-based therapies. Gene therapy experiments are underway that take two different routes to putting a normal version of the CFTR gene into the lung epithelial cells of a patient who is homozygous for a defect in this gene. One route entails placing the CFTR gene in an adenovirus vector, and infecting the epithelial cells of the patient with the virus. Infection causes the CFTR gene to be taken into the cell where it may start functioning normally. A second route entails placing the DNA for the CFTR gene into a liposome. 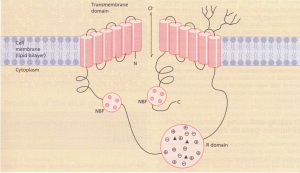 Liposomes are then conveyed to the lung using an aerosol spray and the fatty surface of the liposome fuses with the cell membrane to deliver the CFTR DNA into the cell, where again the gene should function normally. Ultimately this type of gene therapy should give cystic fibrosis patients a normal life without the need for drugs and intensive physiotherapy. Gene therapy for this rare immunodeficiency disease entails the patient’s lymphocytes receiving a normal human ADA gene to reconstitute the function of the cellular and humoral immune system in severe combined immunodeficiency (SCID). Currently it is being tried using lymphocytes for short-term therapy, but for longer term treatment bone marrow transplantation would be the definitive approach. In this disorder a low-density lipoprotein (LDL) receptor gene is inserted into hepatocytes (removed by liver biopsy) from patients with hypercholesterolaemia (a result of a defective LDL receptor gene). Gene-corrected hepatocytes are then reinjected into the portal circulation of the patient. These cells migrate back to the liver where they are reincorporated and should start to produce LDL receptor protein, which dramatically lowers the patient’s cholesterol level and risk of heart failure. There are still many technical problems to overcome in gene therapy, particularly in finding delivery systems to introduce the DNA into a mammalian cell. Very careful control and supervision of gene manipulation will be necessary because of its potential hazards and the ethical issues. Creating and using animal models of human genetic disease One problem in devising new therapies is the need for model systems in which to test the therapies, prior to use in patients. To some extent gene ‘knock-out’ experiments in mice are providing new animal models of disease. In these experiments the normal gene of interest in a mouse is targeted using recombinant DNA techniques so that gene function is impaired in analogy to the situation in the particular gene of a human patient. However mice and humans are different and it will not be possible to mimic some human genetic diseases in mice. Transgenic mice are created when exogenous DNA carrying a gene of interest is injected into a mouse egg. If this egg is fertilized then all the cells of the resulting animal will carry the extra gene sequences. Transgenic mice have also been used as animal models of human diseases in which new therapies may be tested. Other animal models have paved the way for gene therapy techniques. For example, some of the first experiments in the transfer of globin genes (which will be useful for gene therapy for sickle cell disease and thalassaemia) have taken place in mice. These includetransplanting normal donor cells with normal genes into lethally irradiated mice, which results in engraftment of the donor cells. An international effort is underway to sequence the entire human genome, all 3 x 109 bp on the 24 different chromosomes. This enormous enterprise has provided resources for many other projects that are trying to increase our understanding of human genetic disease. Ethical considerations must be taken into account in any discussion of clinical genetics. Options such as prenatal diagnosis with the option of termination may be unacceptable on the basis of moral or religious beliefs. For diseases in which there is no cure and currently no treatment,e.g. Huntington’s disease, genetic tests can accurately predict which family members will be affected; however most people would rather not know this information. One very serious outcome of the new genetic information is that disease susceptibility may be predictable, for example in Alzheimer’s disease, so the medical insurance companies can decline to give policies for high risk individuals. Society has not yet decided who should have access to an individual’s genetic information and to what extent privacy should be preserved.